Good Saturday morning! And welcome back to the Summer of Submissions. I was up before the sun, doing the most important thing first. Which was, of course, sitting in the dark and silent house, drinking the first morning cup of coffee. Then I moved on to the second most important thing: submissions. going with the flow This week, I was much better at going with the flow of summer, of brown and barefoot children, of being realistic about what’s possible. I met my goal of two submissions this week (even now that sounds so paltry: “two submissions” — but I’m not going to give in to the inner critic, no indeed I am not!). I spent an hour on Wednesday morning and an hour this morning prepping, polishing, and sending off. Also in the ‘going with the flow’ department came the realization that, despite my efforts at creating mini-manuscripts that can go out the door as-is, I customized each packet a bit for each submission I’ve done so far this summer. You can see the scribbles and notes on my packet list in the photo above. I don’t think this means the effort that went into creating mini-manuscripts was wasted — the packet list still gives me a great starting point for any submission, and helps me avoid the analysis-paralysis of “oh dear, whatever shall I send to Journal X?” Going with the flow means being flexible and trusting my gut about what to send to a given journal. giving credit Last week I wrote about giving myself credit for all the tasks of writing, not just a sacred few. This mindset helped me feel good about the continued progress I made on creating a reliable system for submissions. Until now, I’ve been using an increasingly unwieldy spreadsheet for logging and tracking submissions. This week I decided to try using Duotrope’s submissions tracker. This required an investment of time: creating a list of pieces and logging the submissions I’d already done this summer. I also created and/or printed a few lists of journals. One came from this website which may be a bit out of date by now, but provides a starting place. Another list I created by searching through the acknowledgements of poetry collections I love — I call this the list of “kinship journals” (this is Sandy Longhorn’s term). A third list came from an unwieldy file of calls for submissions that I had printed out, thinking that they sounded like a good match for my work. Again, the point here is to have a starting place. 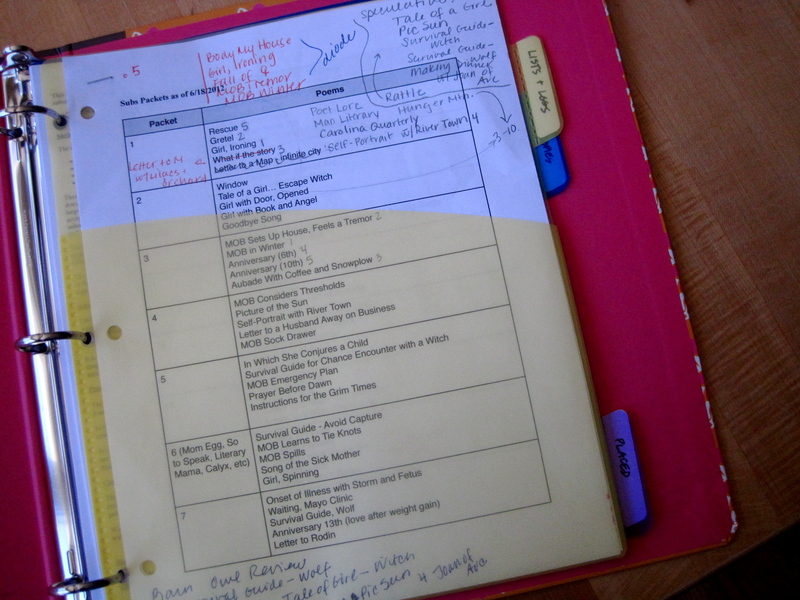 I also created a submissions binder (photo above) with three sections. The first section is for lists and logs — lists of journals, and a printed version of the Duotrope log, which I’ll print occasionally but not with every update. The second section is for clean copies — the current working copy of each poem. This one requires a lot of paper and in some ways defies the ease that technology can provide, but I’ve found that all of my writing process is very physical. From scribbling the first draft in my notebook, to sifting through mini-manuscripts, the body has some sense of how to get the work done and I need the physical element of my process to make it all work. The last section is for placed poems. Again, I have an online file for these poems as well, but there’s something about watching a thin stack get thicker in the physical realm. This week, it was easier to give myself credit for investing time in organization, which is so key to a robust submissions process. Hooray for baby steps! My main effort for next week will be to update the stack of clean copies, and, of course, to submit to two journals. Thanks for reading along about the Summer of Submissions. It’s helpful to me to be reporting progress on the blog — keeps me accountable. Happy weekend, Reader, I hope it’s a great one for you. This entry was posted in journals & reviews, organization, submissions and tagged journals & reviews, organization, submissions by Molly Spencer. Bookmark the permalink. Good luck to the new submissions! I agree completely about the sense of physicality in the work. I’m guessing that there may be a younger generation that can do all of this on the computer and in “brain-space,” but I too love the tangible stack thinning. Sometimes I wish I could get into those younger minds, just to see what it’s like to be able to work that way. But since that’s impossible, I’ll just stick to my little pen and paper world :). Wow, that’s lots of work. Congrats to you for diligence and accountability, as well as creativity! Thanks, Kathleen. It has really helped to document it here on the blog — it makes me realize how much work I’ve actually done… easier, then, to give credit. This has been a good source for places to submit work for me. Of course, you still have to check them out to see what kind of a fit they will be, but every little bit helps when looking for homes for our poetry! Thanks, Val. I subscribe to this list, but haven’t been checking in with it much lately (I set up a separate e-mail account for it). So, thanks for the reminder and the nudge.